Liverpool U18s had an important date at Anfield on Sunday as they secured a place in the FA Youth Cup final with a 2-1 win over Watford. The following day the U18s’ squad had another important engagement as they made their way to Millstead School in Everton. Millstead is a primary specialist school run by Liverpool City Council which offers 130 places to children aged between two and 11 years old. The children include those with severe learning difficulties, profound and multiple learning difficulties, as well as those with complex autism. The players have made two previous visits to Millstead and soon split into groups to meet the pupils and learn about the fantastic work of the staff. In the Cedar class, they joined the children as they created and painted robots, the theme for this term. The sensory area saw the players join the children exploring the theme of Italy, including Italian food such as herbs, tomatoes and pizza dough through smell, taste and through exploring with hands. At the MOVE programme, the players saw how staff helped children with their sitting, standing and walking, increasing their independent mobility. And on the trampoline they took part in rebound therapy, a fun activity that encourages development in the pupils. Of course, there was time for football and the players took turns to play some very tight matches, several of which ended in exciting penalty shootouts! Phil Roscoe, head of education and welfare at Liverpool Football Club, said: “It was fantastic for us to continue our relationship with Millstead. Our visit helped us appreciate once again what a challenging and rewarding place it is and see the wonderful results produced by the skill and care of the staff. “We’re seeing some of the kids we’ve seen before and we’re starting to build up relationships with them which is lovely. The staff at Millstead are also looking forward to developing the relationship even further. 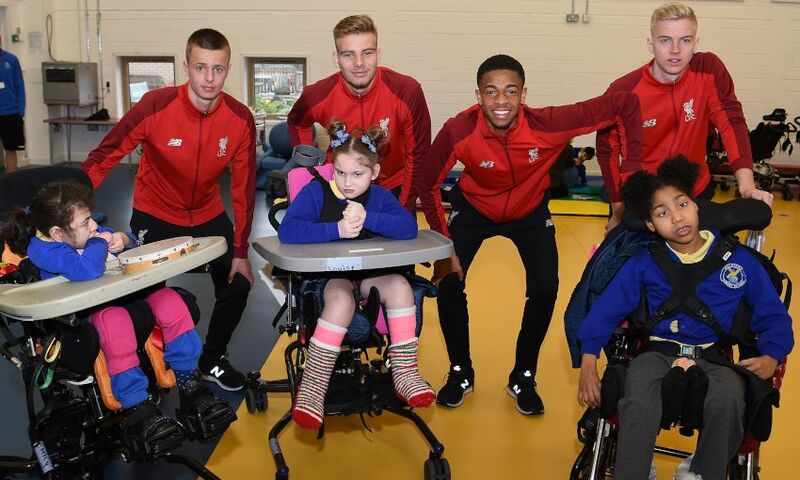 “Our children really enjoy and benefit from the LFC visits to Millstead. Over time the children and staff have developed some good relationships with the players,” said deputy headmaster, Lisa Jankowski. “Our wonderful children are able to showcase their many talents to the players, such as their football skills, their creativity and their imaginative skills.